Happy Tuesday everyone! I feel like I’m always apologizing for my absence, but this time I have a better excuse than I was just lazy or busy. I have been without internet for about 6 days! It was so frustrating wanting to blog and post videos and every upload only getting to 13% and every web page taking an average of 20 minutes to load. We finally got a new modem and had the cable company come out, and everything is working well for the time being! Today I have a polish that is on the top of practically everyone’s list! I guess its an an oldie to some, but a newbie to me! I picked this up at IMATS Toronto because China Glaze polishes were on sale 6 polishes for $20. I figured I had absolutely no excuse not to buy this polish at that point and I could finally understand what people rave about. 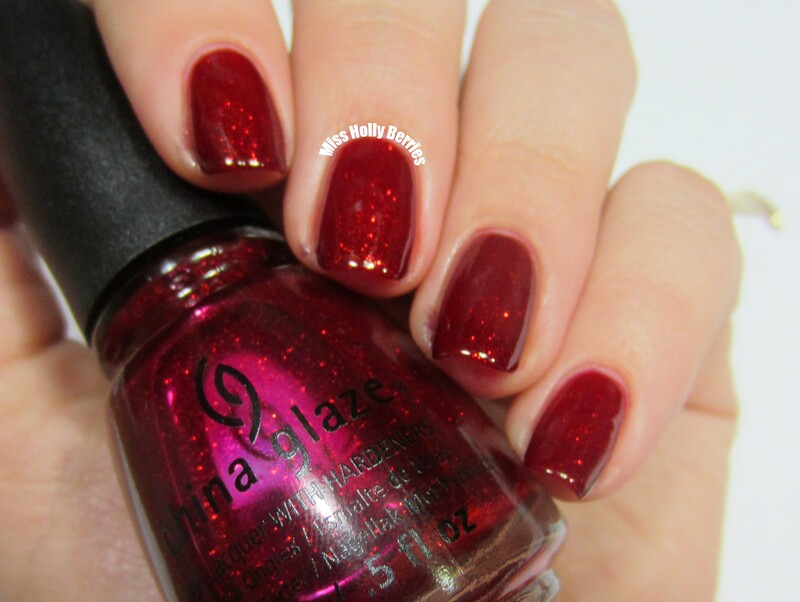 China Glaze “Ruby Pumps” is a red jelly base with red microglitter/microshimmer. Don’t ask me why, but this polish reminds me of the finish of a bowling ball or a sparkly paint on an old car. It has a glitter but it isn’t obnoxious or over the top. Its subtle and classy and makes the polish have a glow about it! The formula on this polish was spot on! No complaints whatsoever. It was opaque in 2 coats, but the pictures show a little bit of a visible nail line. That wasn’t really visible in person, but if you’re a stickler for that type of thing, you can always paint a 3rd coat. What I really was impressed with about this polish was that it wasn’t a pain to remove! Although it is a glitter, it wasn’t as hard to get off as a regular glitter. Overall, I understand what I was missing and I’m glad I finally have this in my collection! What do you guys think? What is your favorite cult classic polish? ← Blog Sale is LIVE!! oh that sounds like a great combo! i was thinking about layering it over black for a really vampy look. have you ever tried that? I love Ruby Pumps! It almost glows from the inside out – such a pretty red sparkle 🙂 You captured it perfectly! love this color, have been wearing it on my toes for a week !! This red suits you really well ! You have to try layering it over Lubu Heels, it’s stunning! Bowling ball…Haha perfect way to describe it! This is one of my faves since I LOVE OZ! Looks gorgeous on you!